I have been invited to contribute to my fourth marketforce event in London, their first event totally dedicated to the hot topic of social media in financial services. Until now, the marketforce team asked me to share some of our unique insights at their events focused on digital banking and customer experience. This event is another validation of the growing importance of social media and digital engagement in banking, insurance and the investment world. Let’s have a closer look at this one-day event, the speakers and the topics covered on the day. In the last 18 months, the number of events focused on social media and digital engagement in financial services has grown exponentially all over the world. It didn’t surprise me. A couple of weeks ago, me and my team celebrated the 5th anniversary of Visible Banking. I launched what was then just a blog back on 4th February 2007 (3 years to the day after Zuckerberg launched facebook) to share my passion for social media and business networking. Over the years, we’ve delivered many unique events (public workshops and internal seminars) on those topics in 10+ countries. We are always looking for unique format and content, and the best contributors. The UK financial services industry is not necessarily the most advanced in the social media space, but I noticed a shift in the last 12 months and I welcomed more engaging efforts from the likes of first direct in crowdsourcing or the Lloyds Banking Group in social customer care. The Marketforce team put together a solid one-day event with an excellent range of speakers and stories. My friend Thomas and myself will bring international case studies to the mix. You will find the full list of speakers directly on the event site. Participating to so many events all over the world, I see less and less value for traditional conferences made of a succession of long presentations with limited time for questions and conversations. I like that this event will kick off with a couple of panel discussions and several short presentations. I invite you to check the full programme. This is going to be a good day and I expect many insightful conversations on stage and in the audience. The speaker line-up -the type and size of the financial institutions and the areas of financial services- will proved to be a good all-rounder. Indeed, the opportunity in social media is not just in retail banking, it is potentially even bigger in other areas such as wealth, investment, insurance and B2B. I am delighted to announce that the Visible Banking community will get a 10% discount on tickets. Please email me to express your interest. The first four people to like the Visible Banking page and reach out will get a 15% discount. Even better news, marketforce will organize a prize draw and give away 5 copies of my book ‘customer experience without borders: a practical guide to social media in financial services‘. 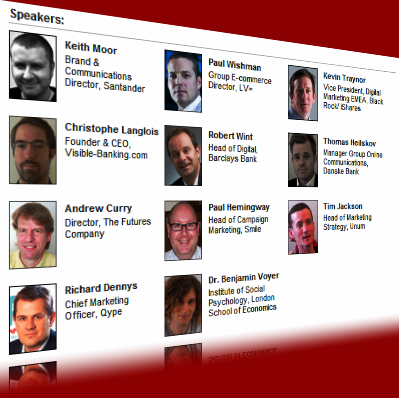 I plan to record a few video interviews with the speakers, so stay tuned on Visible Banking! If you are thinking of attending, send me an email before registering in order to get your discount. In the meantime, follow / join the conversation on facebook (event page) and twitter (@MarketforceRB and the hashtag #smifs).